Margot suggested that all I wrote for this report is that it rained, and WOW has it rained. In August 2003 we only managed 12mm for the month. 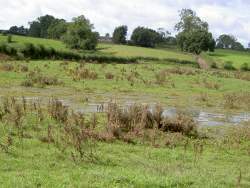 On the 9th August last year it reached 32.2c this year, on the same day, it was 19.4c and 47mm of rain fell!! If you study our weather pages, since we started rainfall reports in 2001 you will see that although we have come close rainfall has never exceeded rain gauge capacity of 125mm during a month……until now. We had to empty the gauge on the 18th removing 120mm worth and then we have had another 96mm giving a total for August 2004 of 216mm a record I think will stand for some time. 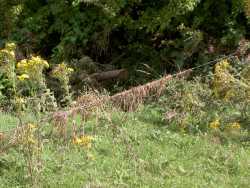 Back with the farming and we have been flooded (no surprise there) on the river meadows these pictures show the remaining water and this is of the electric fence which had been completely submerged the grass hanging on it left behind as the water went down. The cows and heifers have been spending most of their time on the long and key fields away from the water. We had just finished haymaking before the rains arrived but we do still have three loads to empty as it hasn’t been dry enough to do them so they remain parked under the shed. We have had 7 calves this month all Angus's 3 males and 4 females all on the orchard which we have turned into a swamp as we put down some of the hardstanding pictured here with the digger 22mm of rain fell during one day. 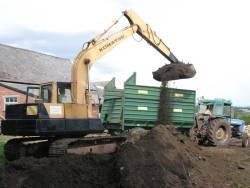 First we dug off the topsoil which is being used to level out a low part of the orchard. It may be a mess at present but when the work is finished and the orchard replanted I’m sure it will be worthwhile. We are hoping that September will be drier as they are starting the removal of the asbestos from the milking parlour on the 6th. 2 weeks milking in the portable one outside on the yard is not a good prospect in the rain. Six of our heifers have returned from Graham’s at Norcroft and we have sent them another 9. Also we are hoping to do the Silaging we had to put off due to the wet. The maize maze opens from the 1st with a difference we are open to groups minimum 15 maximum 20 people. There is a lower age limit of 16 (SORRY NO EXCEPTIONS) and you arrive at 8pm the trip should take ½ to 1 hour email to book. Torches and hi-visibility vests are provided for your safety. 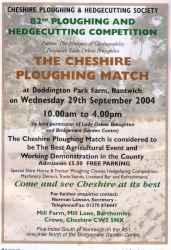 Next month will see the Cheshire ploughing match click the image for details. See you next month PHIL?